Ruud heat pump water heaters, also promoted as the hybrid are coming from the Professional Ultra series and are designed with three tank sizes; 50, 65 and 80 gallons, covering from small to large households. Check out its features that make these units operate with higher performance and efficiency, for greater savings and comfort than if owning an electric unit. The heat pumps are mainly designed for water heating in residential applications, in warmer and milder regions, but Ruud, due to the wide temperature operating range (37-145 F) can operate even in colder areas, without sacrificing its efficiency and comfort. There are three models available that are very similar in construction, but designed for different home sizes. Ruud PROUH50 T2 RU350 D is the 50-gallon model that is ideal for households with four family members and where the unit with small footprint is needed due to lack of space. It comes 3” shorter from the 65-gallon unit or 13” shorter from the 80-gal unit and 2 inches narrower, having only 22 ¼ in diameter vs. 24 ¼ for the other two models. The 50-gal model, with its 178 pounds is also easier to transport and carry – it is over 40 pounds lighter than the next unit size of 65-gal. 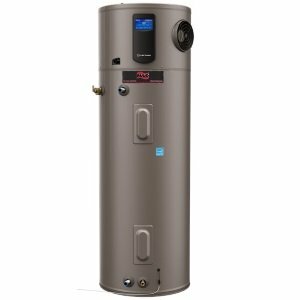 The largest Ruud hybrid water heater is PROUH80 T2 RU350, which, except the larger tank capacity has the highest First Hour Rating of 90 gallons per hour, so it guarantees fast delivery and enough hot water to large families. The water heaters are called hybrids as the units combine electric heating elements and heat pump technology resulting in faster hot water recovery and efficient heating. The electric side uses two Incoloy resistor heating elements made of corrosion-resistant stainless steel that include dry-fire protection making it even more durable – when compared to standard type. As opposed to the electric elements that generate heat, heat pumps rather move the heat from air to water reducing the energy consumption. Energy Saver mode is the default mode that optimizes both heat pump and electric heat providing high recovery and low power consumption. Heat pump mode uses only the heat pump, while the electric heat is not used, resulting in low recovery and energy consumption. High demand – the water heater uses heat pump and heating elements simultaneously, resulting in the highest recovery with decent savings, great for families with kids. Electric – water heater heats the water by using the heating elements only and the energy used in this mode is the highest. This mode shouldn’t be used often, only during the filter and condensate drain maintenance or when the heat pump usage results in very low efficiency such as in cold weather. Vacation – allows users to put a water heater on hold with the time constrain - up to 28 days or indefinitely, while the temperature is maintained at about 65F, preventing freezing if exposed to subzero temperatures. By buying one of the Ruud hybrid water heaters, homeowners will have an access to the innovative electronic system followed by the LCD screen and EcoNet technology for the remote unit control; either to check or change the temperature and heating mode, or get alarmed if there is a water leak. Other characteristics of all three models are the same; compressor power of 4200 Btu/h, recovery rate of 29 GPH, low noise level of 49 dBa and high energy factor of 3.5 allowing more savings and reduced energy consumption. Just for a sake of comparing, one electric unit can reach maximum of 0.99 EF while the gas condensing 0.96-0.98, which is much lower than the heat pumps / hybrids. Due to the extremely high efficiency, Ruud heat pump water heaters are Energy Star compliant. The units are environment-friendly as there is no gas venting and as they are charged with the non-chlorinated refrigerant R 134A which has zero ozone depletion potential. Ruud manufacturer provides a decent warranty of 10 years on the tank and other parts.